"This is the paella all your family and friends will beg you to make again. It has the true flavor of Spain and has been made by my family in Catalonia, Spain for many generations. Enjoy!" 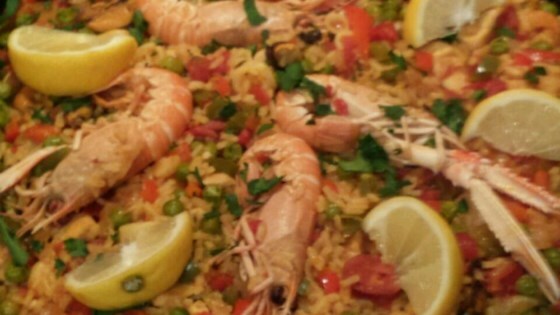 I made this recipe and found it to be the best paella that I have ever had the pleasure eat. Fabulous! Thank you for sharing, Maria. Made a few subs., added a can of Rotel extra hot tomatoes to give it a kick, and added mussels, more shrimp and more calamari. Turned out fabulous! Everyone loved it.Great recipe! !